The Holiday Season is meant to be a time we spend with family and loved ones. We know, however, how difficult it can be to make that happen during this busy time. Whether it’s running around the shops to find the perfect present, or decorating the house masterfully for the holidays and visitors, we can forget to be in the moment and to remember what the holidays are supposed to enhance: quality time with loved ones. The holidays offer a great opportunity to create memorable activities with family and friends! With the chillier weather outside, it’s the perfect chance to bundle up inside for some fun time. Make a family dinner with everyone, light some candles or the fireplace to make it cozy inside, and play a card game or board game with the family. There are myriad ways to have fun and connect with your loved ones. It’s really up to you! Serious benefits come from spending quality time with others. Close relationships help our overall health, and we all want to be the healthiest we can be, right? The United States Institute of Health actually points out how social relationships “affect mental health, health behavior, physical health, and mortality risk.” And keeping social connections continually active is not only beneficial to our minds and bodies but also to our hearts, literally and figuratively. This site also discusses how having close and trusting relationships help us feel more comfortable and confident in our lives. Life Advancer augments this point by explaining how quality family time together builds up confidence in children. Having family dinner together, playing games around the table, or simply talking around a fire with hot chocolate on a cold winter's night are all perfect ways to bond over the holiday season! We know how stressful the holiday season can be. This year, though, we’d love you to take a step back from perfecting every one of your holiday traditions and focus on your relationships. We’ve come up with some fun holiday ways to do this, too! Baking is an activity that can be shared with the whole family. Make a gingerbread house together or have a gingerbread-house-making competition. Decorate sugar cookies with colored frostings and sprinkles to share with an elderly family on your street. Do some creative art projects. Google how to make cards and wrapping paper using potato prints. Try your hand at stringing popcorn and cranberries to decorate your tree or mantle. Cut out snowflakes for your windows. Other possibilities: Pile into the car and drive around the neighborhood to admire the holiday lights and decorations. Ask friends to join you for an evening of caroling. Encourage your kids to go through their toys and find a favorite one to donate to a family in need. Going back to popcorn, make a huge batch to enjoy while watching your favorite holiday movie with loved ones. No matter which event you choose, having this special time together with family and friends is the best way to enjoy this holiday time. 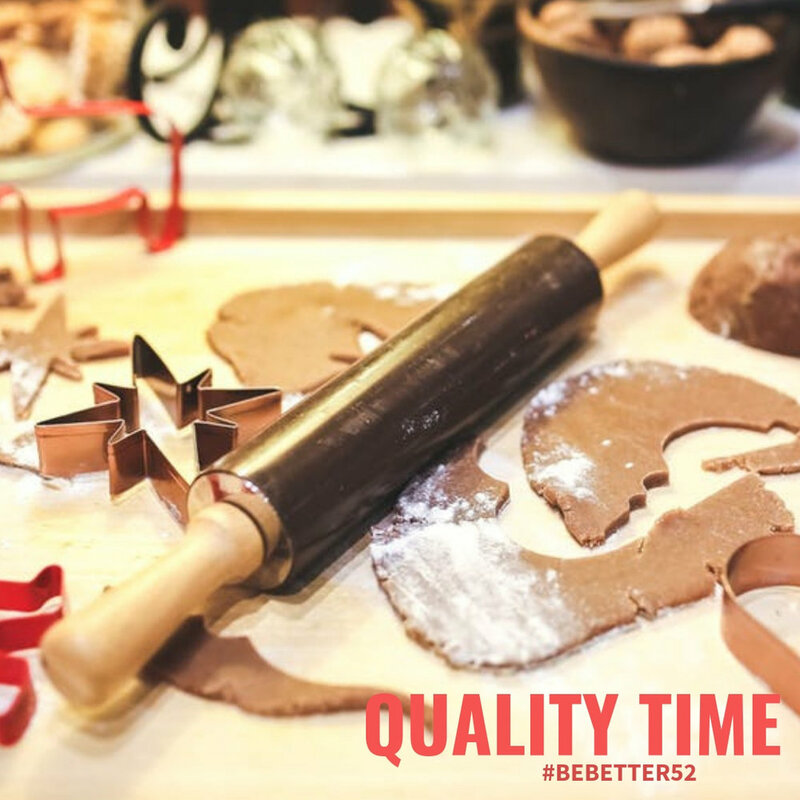 For this week’s #bebetter52 challenge, we’d like you to take at least an hour this week-- when you’d usually be running errands or doing chores--and relax a little and enjoy time with family and friends. You can let those dirty dishes sit for a bit, or skip those multiple trips to every mall in the area to find that perfect present, and instead refocus your energy on spending quality time with your family. We know how crazy this time is, and we can see it in the craze of Black Friday shopping in November all the way to the last minute shopping in December. We hope you’ll be able to take a step back from the stress, and work on being present with your loved ones.